The year 2014 was the greatest year for UFO reports since the inception of CMS, MUFON’s Case Management System, with 8,678 world-wide sightings reported to MUFON. 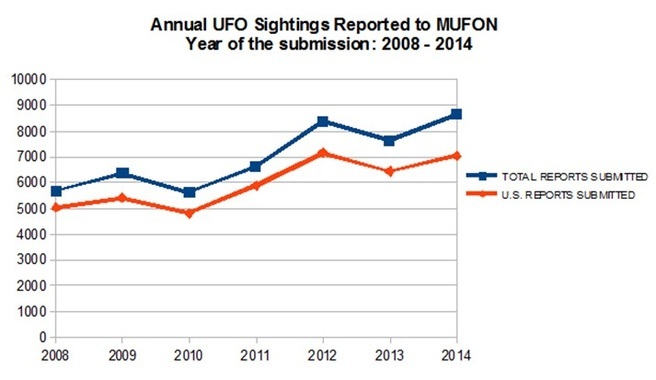 This trend is reflected in Graph 1 and is more indicative of the increased use of the MUFON site by the public. MUFON utilizes trained field investigators with backgrounds in science and law enforcement who interview witnesses to “identify” UFOs. Although most of the reports are identified as known celestial objects, aircraft, meteors, etc., there is always a small percentage of the cases that remain true “UFOs.” These latter cases are carefully reviewed by a science board. MUFON’s Science Review Board (SRB) consists of scientists with degrees in physics, chemistry, geology, optics, and electrical engineering. Their work experience includes NASA, Lockheed Martin, Northrop Grumman, Advanced Mico Devices, Lawrence Livermore National Laboratory, university work, and France’s national space program, CNES. The SRB has reviewed the best cases from the year 2014 and have identified the strongest cases that cannot be identified as any known object. 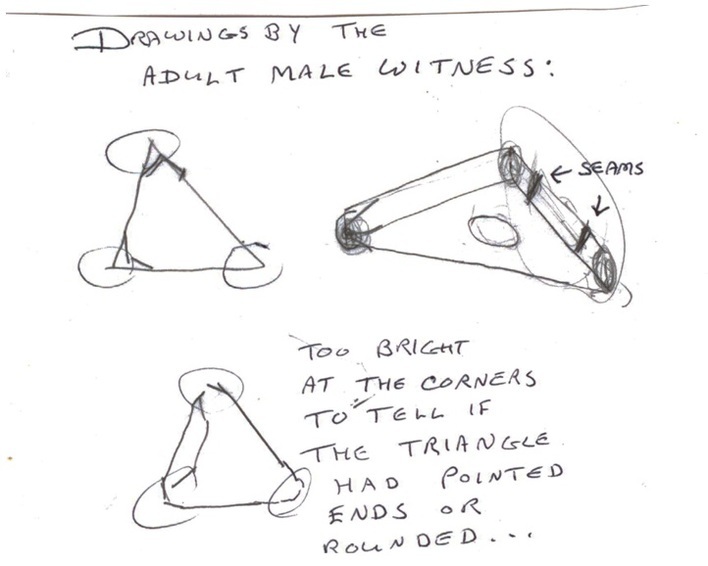 The top cases in 2014 were dominated by triangular and disk-shaped UFOs and were reported by witnesses who included police officers, a pilot, a math professor, a former military officer, and several people with advanced degrees. MUFON was founded in 1969 and is the leading civilian UFO investigating body operating in the United States and abroad. 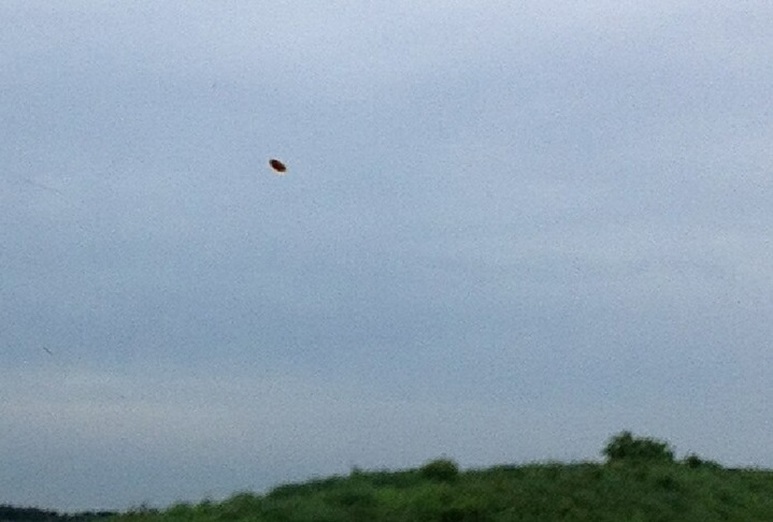 A mother driving with her 14-year-old son noticed a metallic object in the sky in the late afternoon of June 8, 2014. At first they thought it was a plane, but the reflection of sunlight from it appeared very bright. Initially the object appeared small but that changed as it got closer. As it approached it appeared gray with an oval shape. Her son rapidly took 13 photos within about 8 seconds. Shortly thereafter they lost track of the object as they exited the freeway. Analysis of the photos revealed that the object’s apparent size in the sky was roughly that of the full moon. Photo analysis eliminated the possibility of an insect, bird, bat, or conventional aircraft as the object in the 13 photos. The object was disk-shaped and its distance was between 500 to 1,900 feet away. This would fit with an object between 5 to 20 feet in size and traveling between 150 to 600 mph. It was about 9:30 p.m. and just outside of Joplin, Missouri, when a former police officer, a commercial airline pilot, and a licensed nurse’s aide saw a box-shaped object overhead and about 300 feet off the ground. It was off white in color and appeared to be illuminated by a yellowish light from within it. They estimated it to be as large as a house or larger and it was completely silent. It was flat on the bottom with round orange and red randomly flashing lights all around the bottom edge. Its speed seemed slow at approximately 100+ mph. It suddenly turned off its lights, all of them went off like they were quickly dimmed and not just cut off. It then started to descend sharply as if it was going to land (or crash) somewhere nearby. It stayed perfectly level as it descended behind the trees on the horizon; it seemed to form a light mist or fog around it as it descended. They noticed that along its flight path every dog was going crazy, barking and howling. The three got into a Jeep and drove in the direction they thought it may have gone. They used a spotlight that plugs into the Jeep’s electrical system. They were not successful in finding the object again although twice during their search the spotlight faded and the Jeep had electrical problems. Case 59680: 8:01 p.m. September 7, 2014; Augusta, Maine. 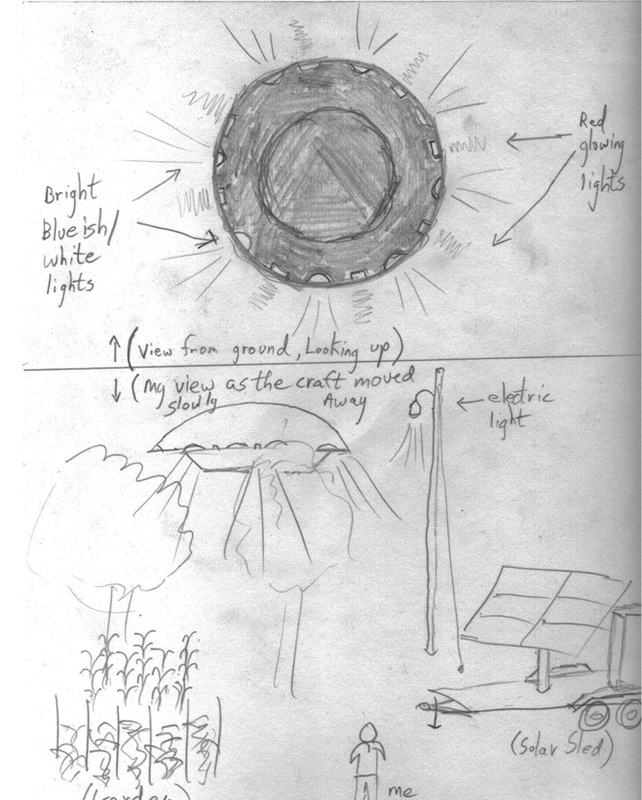 In the early evening of September 7, 2014, in Augusta, Maine, a math professor, his wife, and three teenage children saw a triangular-shaped UFO. The event is best described in the man's own words. “We had just gotten on I-95 north in Augusta, Maine, at exit 109. The sky was clear. It was dusk. The sky was still bluish pink from the sun setting. We all noticed something hovering in the sky on the opposite side of the highway in front of us. It was triangular. It was not moving. At each vertex of the triangle there was a white light. The three lights appeared equidistant from each other. We could see a flat bottom and the light allowed us to see a 90 degree angle where the bottom met the edges that then moved up to give the object height. Most of us couldn’t stop looking at the edges because they were not anything like any aircraft that we are familiar with. We could see that the object was a flat metal color. It had no shine to it. Where the light hit the object, it looked like a tin color. There were no color lights at all. My wife was driving, but she could see it out her window, but not for as long as I could see it from the passenger seat. My three children were in the backseat. All three children saw the object. I saw it out the front window first, then through the back window, and then I took off my seatbelt and stuck my head out the roof through the sunroof. When I stuck my head out the roof, I could not hear anything more than the wind caused by driving. No airplane sound at all, at anytime. The object never moved; it just hovered. My wife was afraid to pull over, so we lost sight of it as we drove away. We do not look for UFO’s. This object was so out of place that it was difficult for us not to notice it. All of us noticed it at the same time, and we were all in shock as we stared at it for as long as we could. My daughter even became frightened; it was that real to her. I did not try to take a photo because there was not enough time, and I would have lost a lot of the time I had to observe it. All we had was our cell phones, and we didn’t think a cell phone picture would have shown anything more than the lights, so we just watched the object as we drove away from it. Case 54501: 9:40 p.m. March 6, 2014; Cheyenne, Wyoming. Two witnesses, Jon and Curtiss were returning from the Overland (Mountain) Bike Meetup in Fort Collins, Colorado. They headed home in Jon’s pickup truck at around 9 p.m. and were driving North on I-25 toward Cheyenne, Wyoming. At approximately 9:40 p.m., 5-10 miles south of Cheyenne, Jon noticed three, big, bright, greenish-yellow lights directly ahead and slightly to their right. The lights were coming in their direction. The lights grew brighter as the object drew closer. Soon, they appeared to be flying parallel to the highway and still coming in their direction. At first the two believed they were seeing a C-130 from FE Warren AFB headed in their direction. However, the lights suddenly went from horizontal to vertical and the witnesses thought the C-130 was going to crash into them. Curtiss yelled “step on it!” because he believed they may be struck by the huge object. Then, the object tilted to a 45-degree angle, like it was doing a “barrel roll” right over the interstate, and disappeared above the truck. At its closest point, the object was within 500 feet of their truck. The object remained completely silent during the entire event, which lasted for approximately two minutes from the initial sighting of the object to its disappearance behind them. Case 59470: 4 p.m. November 7, 2006; Chicago, Illinois. The Chicago O’Hare case of 2006 is one of the most famous UFO sightings of recent time and it received a lot of media coverage when it happened. Commercial airline pilots, maintenance crews, and others at the airport witnessed a disk-shaped object hover above Gate C17. 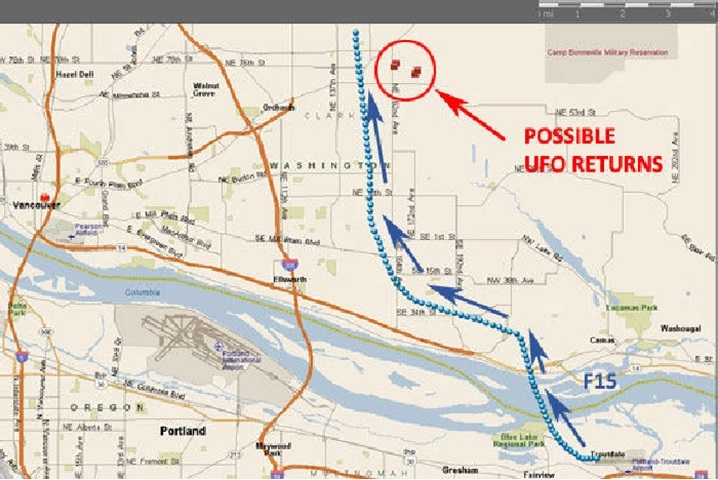 MUFON received a report this year from a person who was on an arriving jet who witnessed the event unfold. This witness, a draftsman in the oil industry, still has his boarding pass for the plane in which he was seated. Here is his story. “In October/November of 2006, my wife’s father, who is a Command Master Chief in the Navy, invited us to Okinawa Japan. The UFO sighting I am referring to occurred on November 7th, 2006 above Chicago’s O’Hare airport. Our plane was United Airlines flight 0878 and I was seated in row 37(I still have my boarding pass). The sighting happened at roughly 4 p.m. Our plane was descending to land and I was waiting to see the airport as we were passing through the clouds. When we cleared the cloud level, I immediately saw the airport and gradually noticed a gray, round object. This object was motionless. I know this because our altitude’s “crossed.” Meaning there was a definite moment when we were above it, a moment when we were level, and a moment when we were below it. It was during this transition in altitudes that I have my most vivid memory of its description. It was elliptical in shape, dull gray, with no visible markings. There were no openings for windows or doors. As we landed I lost sight of it but saw it again as our plane was turning on the tarmac. Its size at that moment was about the size of a half dollar held at arm’s length. I remember the flight attendant handing me a customs pamphlet to fill out. I looked at her and looked back at the object. It was still there. Within seconds of me looking back at it, it rapidly “shot” up. The only way I can describe this movement is if you were to hold an object at eye level, release it and watch it fall to the ground. In other words, imagine the cloud level as the ground and the object “falling” towards it. I remember ducking to see where it might have gone. I remember seeing a “hole” in the cloud level. I also remember seeing light reflected off the interior of the hole so the hole must have went straight through the cloud level. I did not mention this to anyone accept my wife who did not see any of this happening. It was only later, in January of 2007 that I saw a news story of this object that I had seen. In this story they mentioned that the workers on the tarmac and some pilots had seen this object so I knew I had not hallucinated this event. I remember being shaky after we left the plane and went through customs. That’s all that happened. I have never seen a UFO before and never since. Case 57173: 1:20 a.m. June 19, 2014; Arvada, Colorado. At 1:19 a.m. on a June morning in 2014 a metropolitan Denver area police officer on routine patrol pulled into a large park on his rounds. From the northern entrance of the park he observed a pattern of multicolored lights in a roughly oval pattern at the southeast corner of the park about 500 feet away. The highest light appeared to be about six feet off the ground. He immediately drove to the area to investigate possible illegal activity (curfew violation) and the lights all simultaneously disappeared as he approached. When he arrived at the incident site the officer shone his car’s spotlight on the area and observed that the grass and trees were covered in a white substance, and noted a very light mist gently falling. He noted that he had been in other areas nearby that evening, including others near water, and had not seen a similar phenomenon. Case 53948: 2:45 a.m. February 6, 2014; Norcross, Georgia. Two witnesses observed a large black triangular object and actually drove beneath it as it hovered mostly over the southbound lane of I-85 near Norcross, Georgia. Traveling from work at about 2:45 a.m. on I-85 North, the object was first seen just north of the Jimmy Carter Blvd overpass and initially appeared to be a low flying aircraft with landing lights. As they approached they saw a rectangular array of lights making it obvious that the object was not an ordinary aircraft. The witnesses, Joshua and Jeremiah, drove under the object which was approximately 400 to 600 feet above. Joshua looked up through the closed window and could not see the entire object. Jeremiah could not see the underside at all from his passenger side position. 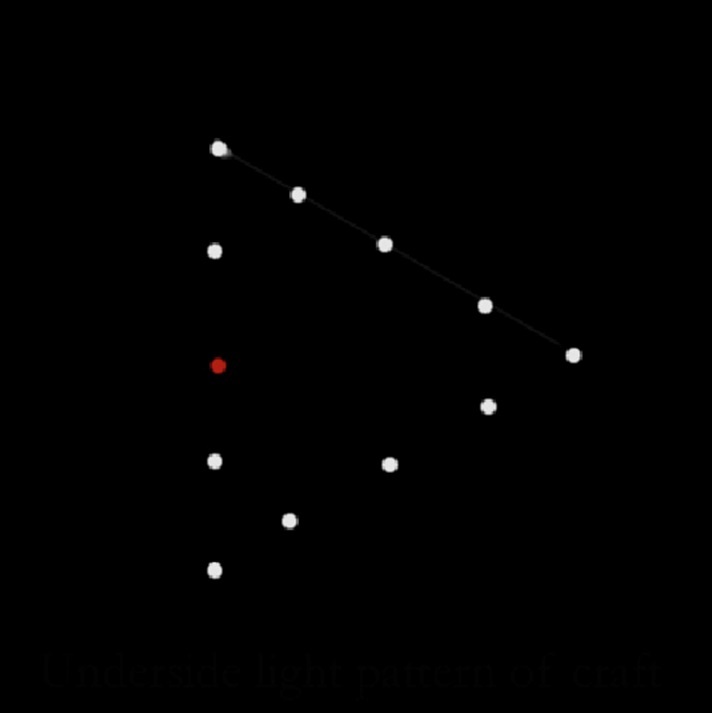 Beneath the object, Joshua observed several white recessed lights along the edges of the triangle and one recessed red light at the “rear” of the object. The object, estimated to be 280 to 300 feet along one edge and some 30 to 35 feet high, did not move or rotate during the entire sighting. After passing under the object, they tried to keep it in sight; Joshua looking in the rear view mirrors and Jeremiah looking out the back window. Somewhere before reaching Beaver Ruin Road they lost sight of the object after going far enough for the lights of the object to become confused with the background city and tower lights. They did a u-turn at Beaver Ruin Road but failed to see the object again. The whole sighting lasted an estimated five minutes and there was no sound that could be associated with the object. Case 58305: 2 p.m. July 15, 1975; Gulf of Mexico near Panama City, Florida. Testimonies of a UFO event were obtained separately from two brothers, one a graduate military electronic engineer and the other a former U.S. Army Officer with a masters degree in architecture, that happened 40 years ago in the Gulf of Mexico while they were fishing. 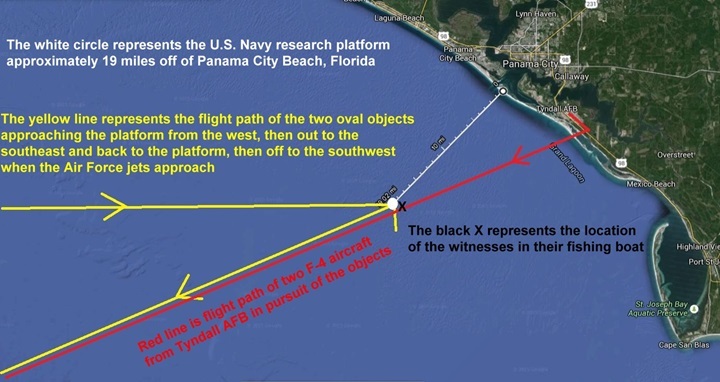 The two men were in an 18-foot boat anchored about 19 miles off the coast of Panama City Beach, Florida about 100 feet away from a U.S. Navy undersea research platform. While fishing, they both saw two metallic craft each about the size of a Boeing B-727 jet aircraft, only circular, approach noiselessly from due west at approximately 40-60 mph stopping to hover near the navy platform. As the objects were approaching from the distance, Navy frogmen could be seen descending stairs on the platform to enter a rubber raft. However, when the craft came very close to the platform, the frogmen must have seen the object and they rapidly climbed back up the stairs into the facility. The two craft then hovered for 5-10 minutes about 300 feet above the water appearing to observe the research facility, at which time they were about 100 feet from the two brothers’ boat. They could clearly see the bottom half of each disk-shaped object, which appeared elliptical in shape from the side and was a purplish matte color on the bottom half to the center horizontal parting line and a silver matte color on the top half. They saw no markings, windows, or seams. The witnesses said the two disks appeared to be the most perfectly constructed objects they had ever seen in their lives. Case 56134: 9:30 p.m. May 8, 2014; Monticello, Mississippi. ​The witness is a college-educated technical writer. The witness lives in a rural area and had just gone outside to adjust his solar panels when he glanced up at the night sky. He was stunned to see a large, round (from his perspective) object directly over his head. 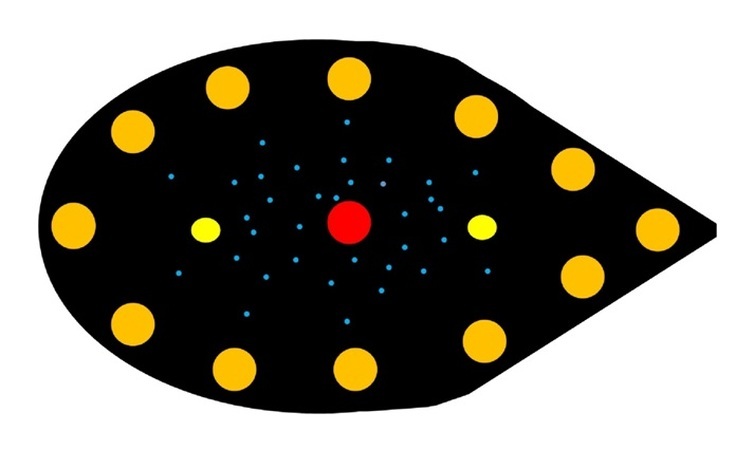 It was emanating bright blue/white lights outward around its outer edge, and had red lights interspersed unevenly between the bright blue lights. The object was slowly rotating, and almost immediately began moving slowly west over his garden. As it moved away from overhead to the west, he did see that it had a curvature on top. At times the lights (red and bluish-white) seemed to cross over each other around the edge – sort of “dancing” around the edge of the circular/domed object. After a few seconds the witness ran as fast as he could into the house, grabbed his iPhone, ran back outside and could still see the object moving slowly away. By the time he signed into his iPhone, and launched the camera app, the object had moved beyond his line of sight, and he no longer could perceive its “glow.” The witness did provide a drawing of what he had seen. Case 59652: 1 p.m. July 2, 2014; Vancouver, Washington. A law enforcement officer reported this UFO sighting on the basis that his identity would be protected. The event that unfolded is best described in his own words. “At approximately 1300 hours, I was on-duty and near the intersection of (Location Deleted by JC), Vancouver, Washington. The weather was warm, with excellent visibility, and a partly cloudy sky. I was in my vehicle, facing east. My window was rolled down, providing me with an unobstructed view of the southern and eastern sky. "I noticed movement in the sky, approximately forty-five degrees above the horizon, to the southeast. "I observed a metallic disc, silver-in-color and circular in shape, moving rapidly across the sky from the south to the northeast. "This movement was from my right to my left. The object was shiny and glinted in the sun as it moved. It appeared to be several thousand feet in elevation, and from my perspective, appeared to be the size of a dime held at arm’s-length. "I heard no sound at all from the object, and there was no contrail. "Further, it looked uniformly metallic and circular, with no visible wings, tail, windows, lights, landing gear, or other components of conventional airframes, both rotor and fixed-wing. "It also did not look similar to any Unmanned Aerial Vehicles I have observed. I observed the object travel up and to my left, which was north/northeast. I saw it increase in elevation rapidly in a straight line, and it appeared to be travelling faster than any conventional aircraft. "After approximately five seconds, I observed the leading edge of the object shimmer and disappear. I observed this continue, as an image of the surrounding blue sky enveloped the object, moving in a vertical line across the surface to the rear edge, until the object blended in with the sky behind it. "As this change occurred, I observed a slight blurriness in the changed areas, inconsistent with the sky behind it. "This distortion was similar to looking at an object immersed in water. However, once the entire object had changed, this effect stopped and I immediately lost sight of the object. The time from complete visibility to disappearance was approximately two to three seconds. "At the time of disappearance, the surrounding sky was blue and cloudless. I continued looking but was unable to find the object. "Approximately thirty seconds later, I observed a jet fighter aircraft flying rapidly along the same course the disc had taken. I recognized this aircraft, based on prior experience, to be an F-15. I was only able to observe the bottom of the aircraft, and no insignia were visible, but it looked identical to the F-15 fighters based at the Portland Air National Guard base. "I observed the F-15 follow the same flight path, moving from my right to upper left. "It continued, flying beyond where I had last seen the object, but in the same direction and elevation. "From my perspective, the F-15 was the approximate size of a quarter held at arm’s-length. Additionally, the F-15 was extremely loud while passing over, whereas the disc was silent. I observed the F-15 continue to the northeast, out of my line of sight. "Based on my training and experience, this was no known military or civilian aircraft, Unmanned Aerial Vehicle, astronomical phenomenon, balloon, atmospheric effect, or misidentification of a known object. Radar data was obtained that confirmed the flight of the F-15 jet aircraft seen by the officer. An unknown also showed up briefly on radar. Whether it was the disc seen by the officer is not known for certain. For the latest UFO news, visit www.OpenMinds.tv.